It’s a Carnaval de Québec knuk! That is, one of the playful sidekicks of Bonhomme Carnaval, the Quebec Winter Carnival’s snowman mascot. Spotting Bonhomme and his knuks is one of the things to do in Quebec City during the winter carnival. 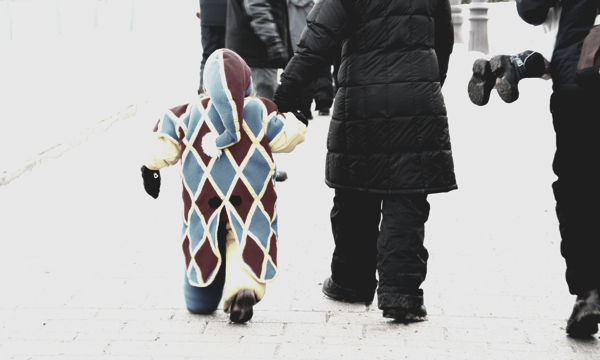 Marching through the historic part of Quebec City, this wee one is accompanied by his mom while his li’l sis, dressed up as Bonhomme himself (complete with traditional red toque, sash tied at the waist, and head-to-toe white), is carried by Dad till she agrees to tag along. Oh my gosh, I want to hug them both! 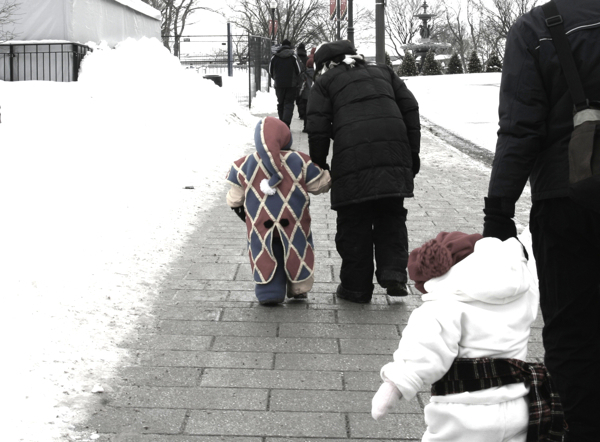 Believe me, the little Knuk and Bonhomme were just as adorable in person as I was chasing after them walking to the Quebec Winter Carnival festivities on the Plains of Abraham. Too. Cute. For. Words. Where: Quebec City, Quebec, Canada. Activities are concentrated in Old Quebec (the historic Old Town), specifically on the sprawling Plains of Abraham. When: The 59th edition of the modern incarnation of the carnival runs February 1-17, 2013. Yes, that’s a year away, but it pays to be prepared! Cost: A Bonhomme Effigy (a figurine of Bonhomme) is required for most of the 300-plus activities and shows. In 2012, the Effigy cost $13. Attach the Effigy to your coat to access all 17 days of festivities. You can buy your Effigy starting in January 2013 at hundreds of shops in Quebec City, or on-site during Carnaval. Why: It’s the world’s largest winter carnival! And Old Quebec is picturesque.